A selection of printed origami papers. Japan is a paper lover’s heaven. There are kinds of paper for everything and arts developed for different kinds of paper. It’s easy to blow a month’s salary on paper goods if you do not take care. Ummm, how do I know…? Japanese paper arts are also quite well known around the world. Which can be good, yet can be confusing. 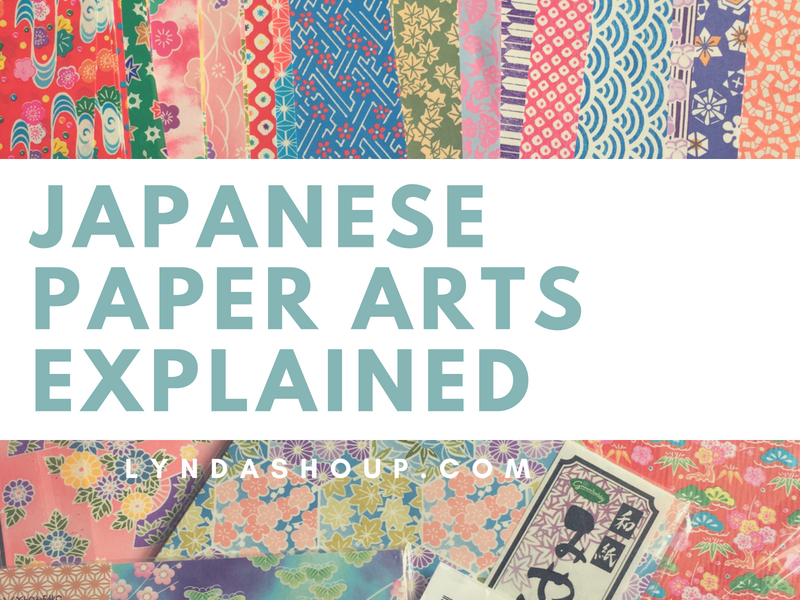 The purpose of this blog series is to give some clarity to the myriad kinds of Japanese paper arts that have found their way into our crafting orbit. They will be interspersed with projects using those craft forms. Traditional Japanese homes had sliding doors called shoji. 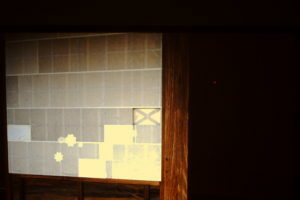 These are some that are covered with washi and patched whenever a hole appeared. The word for paper in Japanese is 紙 kami. (Don’t confuse that with the words for神 God or 髪 hair, both pronounced the same way.) When kami is combined with other words it changes to “gami”. The character for paper can also be pronounced “shi”. The word for Japanese paper is 和紙 washi. The 和 “wa” means Japanese and the 紙“shi” means paper. Which is all very confusing when you think of washi tape. Washi tape isn’t always made of washi. It was originally made of rice paper. In fact, in Japan it is called masking tape, sometimes referred to simply as MT. Washi tape sold stateside is sometimes made of rice paper, but often made of other materials. Washi is traditionally made from materials found in Japan such as fibers from mulberry bushes, gampi, mitsumasa, and rice. So what do you do with this paper? Origami folds are referred to as 山 mountain or 谷 valley folds. Origami is familiar to many people around the globe even if they had no idea how to do it. Origami is the art of folding paper into things. Sometimes useful things and sometimes whimsical things. Sometimes mindblowing things. I have seen children play together making origami. The most delightful thing to me was seeing a grandmother on a train entertaining her grandchildren by pulling a plastic bag of origami paper out of her bag and make things for them to play with. While this isn’t the norm, it is not unusual. Origami boxes I made using Tomoko Fuse’s directions. These are made with my monoprinted papers. Origami paper is usually square and typically comes in a standard size. Other sizes can be found, but there are several sizes that are the rule. Some origami patterns call for rectangles and even circles, but they are seriously in the minority. 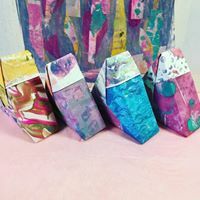 While there are many types of paper that can be folded into useful items, paper sold specifically for origami is usually very thin and easy to crease. 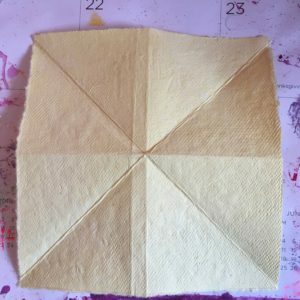 This doesn’t make a big difference if you are folding a basic piece, but if the form has many creases it can be very difficult to get the exact folds with thicker paper. I try to choose a weight of paper that is no thicker than standard copy paper. Thinner than that is preferable. 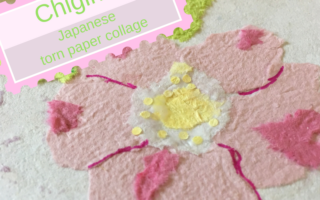 This handmade paper is called Washi Chiyogami or Yuzen Chiyogami. Washi means Japanese Paper and refers to the traditional form of making paper from mulberry bark, mitsumasa, gampi or rice. This paper is then stenciled by hand making it more delicate and higher in quality than the mass-produced variety. Notes for the handmade paper maker: If you want to make paper to use for origami, the thinner you can make it the better. I love the pieces that I can almost see through for origami. Much thicker and it becomes difficult to fold sharply – a feature of origami which is essential for a great final project. You are so right about Japanese papers being confusing. Thanks for shedding some light. Very interesting. Jill, I am so glad you found this interesting. There will be some projects and more information about ways paper is used. Let’s also acknowledge that there may be a bit of hoarding of Japanese paper goods somewhere in the vicinity. Lynda, thanks so much for this post. I had no idea there were such differences! I love Japanese papers and I love Japanese Masking Tape MT haahaaa that made me laugh! I’m glad you enjoyed this post. I am having fun thinking of some of the paper forms that I have loved so much. 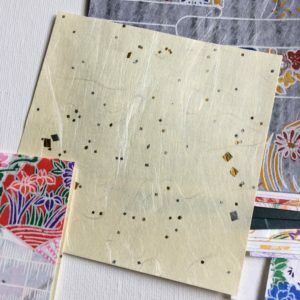 I have always been a little curious about why the decorative tape we all love came to be known as washi tape, so I did a little digging to find out. Washi is such a special type of paper. I was pretty sure that not all of it was made from washi.